This has always been a hot topic and one that has caused much division. There is an argument that when Paul talks about the local church in relation to men and women that he is only speaking to the church back then and that it was cultural and not meant for today. I’ve never liked that argument because it’s pretty shaky and falls apart when applying it to other areas of Scripture. Are we going to say that John 3:16 was cultural and not meant for today? The principles of how we conduct ourselves in the church are as relevant today as they were in the first church. What I have taken away from my recent studies, and was really more of a confirmation than something new, was that God has established an order in the church. The order is not based on skill, ability or social rank but is based on God’s divine revelation in creation and his Godhead. He doesn’t want chaos and He doesn’t want things out of control. He sets forth how things should function without giving specific details. He did this because we are not under a law anymore in the church. That Old Testament law was given to one nation. The church is for all people and therefore the principles of the church must be able to fit into any culture or era. Thankfully the Lord is never wrong and in giving us the New Testament He avoided being specific about how we practice. Having said that, there are just a few things that the Lord does lay out for us that relate to practice. In regards to men and women, it’s very clear that in the church men are to be the public prayers, teachers and leaders when the whole church is come together (1 Cor. 14; 1 Tim. 2). Outside of that parameter things get a a lot more open and flexible. Home studies, conversation studies, group prayer times etc. do not fall under that condition as long as the whole church is not expected to attend or be gathered in one corporate setting. In these cases, men and women are free to participate in those activities. I realize not everyone will agree but I believe it to be consistent with Scripture. Too often views are expressed based on personal preference not context or logic. I’ve tried to step back and look at the Scripture from a fresh perspective. While the core of what I have always believed is still there, the practical application of it has changed slightly over the years. This is partly due to seeing other countries and how they worship and fellowship, but also from stripping away the church traditions I have grown up with and looking only at Scripture. Let’s look at a few of these things more closely. The basic foundation of the roles of men and women come from this one truth. God has authority and He has a structure for administering authority to His people. This started before the world began in the relationship we see between the Father, Son and Spirit. Even in the Godhead we see authority. The Lord Jesus many times tells us that He was obedient to the Father. We also learn of the Spirit’s submission in pointing us to the Son. Were any of the persons of the Godhead inferior? Absolutely not! This has also been the case right from Adam until today. In the garden He made man first and gave him authority (Genesis 2:15-20). He then made Eve and presented her to Adam as his wife – one flesh. Whether or not you believe that Adam had any authority over Eve initially, when Adam and Eve sinned the Lord caused Eve to be put “under” the authority of Adam (Genesis 3:16). Was Adam better than Eve? Not in the slightest. They were equal. Yet God placed authority on Adam to rule over all the creation and to be the head of his wife Eve. That truth is carried into the New Testament as the husband is still the head of the wife (Eph 5:22-23). The nation of Israel always had a leader. Trace the line from Abraham, Moses, the judges, the prophets and on through to the kings and you will find that someone was in charge, under God to be the authority of the people. These leaders were fallible and often made mistakes, but God still held their authority in place. In the church, God has made all of us members, a vital part of one body connected to each other (Eph 4:11-16). We need each other. He has made us all priests with the task of bringing glory to Him (1 Pet 2:4-5). Some will say that because of this there is no longer any authority structure. They will point to verses like Galatians 3:28 and say this shows we all have the same role to play in the church. This view is incomplete and ignores other verses which clearly show that there is still authority in the church. 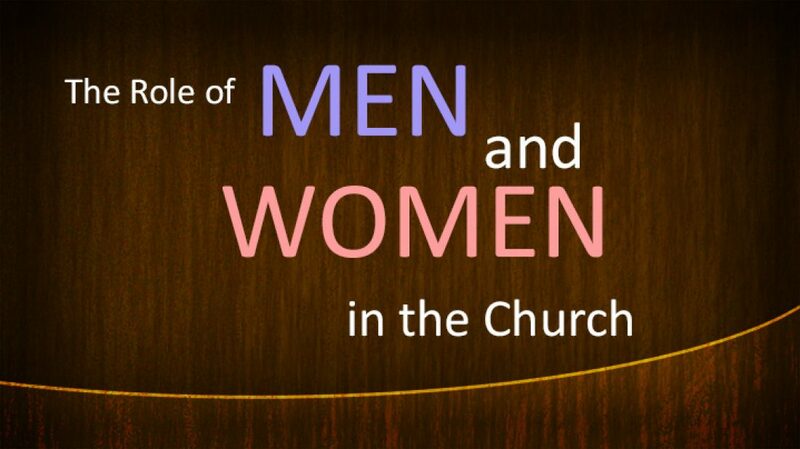 We will continue this discussion on the role of men and women in the church in our next article.